A collaborative project with Celia Pankhurst, Joe Friedrich and Stacie Stilling. In an effort to address generational environmental debt, we used heirlooms as a point of entry. Familial traditions and heirlooms are glimpses of what mores, priorities and memories were/are worth preservation. Oral traditions can transcend time through seeds of emotion whose permanences rest in their repetition. 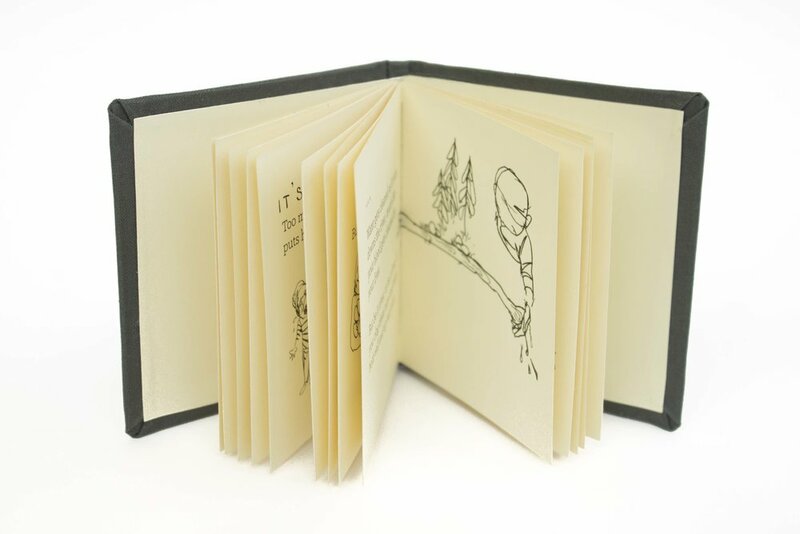 This small pocket book of peculiar poems and rhymes is meant to impart younger generations with a sense of care for the natural environment and small poetic triggers for sustainable habits. Individuals are rarely, if ever, held responsible for the downstream consequences of their actions. The normative collective misuse of our planet and it's resources runs a steep deficit, which if left unpaid, will be passed onto future generations. Current populations are delinquent, leaving our lenders with a whole host of issues which are on the brink of being beyond restoration, let alone compensation. The inability for individuals to situate themselves within or contextualize generational debt remains largely invisible due to the aforementioned complexities and the ambiguity between when one generation passes and the other takes over.